A two-seater Mini Cooper has arrived and we couldn’t be more thrilled. Bullz-Eye had the opportunity to test a 2012 Mini Cooper S Coupe for a week and we had a blast. Our test model was loaded with exterior goodies including 17 inch alloy wheels, Xenon headlights, white turn signal lights, black headlight housings, silver sport stripes and foglights. Its body design is based on a faithful interpretation of Mini design and places a clear emphasis on the brand's sporting genes. 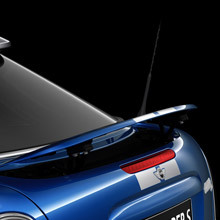 Plus, it features a number of eye-catching individual touches which amount to rather more than model-specific details. The overall look is very aggressive, and although some might be hesitant to accept the progressive design, we admired it during our time with the 2012 Mini Cooper S Coupe. 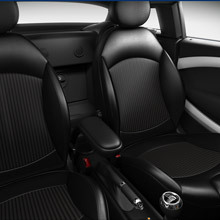 Classic Mini interior with a touch of two-seater sportiness and you arrive at the2012 Mini Cooper S Coupe, which is fun all day long! I agree with Mini that the design of the Coupe's interior also showcases the pure-bred character of a compact sports car. In typical Mini style, the Coupe also has a large Center Speedo and a tachometer positioned directly behind the steering wheel, and the standard-fitted sports seats offer outstanding lateral support through quickly-taken corners. The colors of the interior, meanwhile, also help enhance concentration on the road ahead. Regardless of the combination of upholstery variant, trim elements and Color Lines chosen by the Mini Coupe owner, the interior color remains Carbon Black. An anthracite roof liner is also part of the standard specification. The feel is all about driving and being as free as possible and that to me is what separates Mini from the rest. Our S Coupe also had a retractable hardtop, but we drove the car in the middle of January in Ohio, so not too much driving with the top down. The test model was filled with options that included voice command navigation, Bluetooth with USB and iPod, a very cool chrome-lined interior, center armrest, booming Harman-Kardon sound system, smartphone integration, real time traffic information, air conditioning with microfilter air recirculation, remote keyless entry, Sirius satellite, onboard computer, leather three spoke steering wheel, and carbon black/beige punch leather sport seats. I found plenty of headroom in the S Coupe but storage is at a premium. 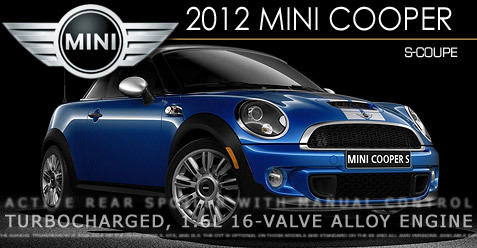 This is where the word “fun” really enters into the equation with the 2012 Mini Cooper S Coupe and it‘s contagious. Our test model boasted a turbocharged direct injected 1.6 liter 16 valve inline 4 cylinder engine that pumps out 181 horsepower, dynamic traction control, steptronic automatic transmission with paddle shifters, sport suspension, MacPherson strut front multi link rear suspension, electric power assisted steering, 4 wheel anti-lock disc brakes, corner brake control and much more. What this means when driving the S Coupe is that the powerful and balanced ride equates to something only a two-seater can deliver. Turning corners almost becomes a sport in the S Coupe as this vehicle hugs the road with the best of them my friends! As Mini likes to say, in the Mini Coupe, engine power is converted into pure driving fun more directly and comprehensively than ever. Cutting-edge drive system technology ensures that the engine's output and torque are generated with exceptional efficiency – and experienced with great intensity by the driver. Instantaneous power development delivers impressive sports performance, while high elasticity and optimum gear ratios guarantee unbeatable agility in mid-range acceleration. Maximum torque of 177 lb-ft is on tap as low down as 1,600 rpm, and can be raised to 192 lb-ft for a short time using the Overboost. This function serves up additional pulling power to ensure particularly dynamic acceleration. 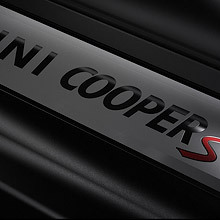 The Mini Cooper S Coupe dashes from 0 to 60 mph in just 6.5 seconds, and its top speed stands at 142 mph. These performance figures team up with average fuel consumption in the EU test cycle of 5.8 liters per 100 km and CO2 emissions of 136 grams per kilometer. Hit the “sport” button for quicker throttle and steering response and you’re pretty much hooked to that mode going forward. The 2012 Mini Cooper S Coupe offers up plenty for a sticker price of $33,400 on our test model, and at 26 mpg city and 34 mpg, you can stretch those fuel prices out for other needs. This car is for those who really have a passion for driving and can appreciate style both in their everyday lives and in the vehicle of their choice. 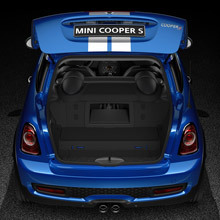 A two-seater has the luxury of serving as both your everyday car and your weekend cruise ride and I’m guessing the 2012 Mini Cooper S Coupe will fill those purposes and more. We can only hope to revisit the Mini Cooper S Coupe when the weather breaks in the Midwest!